While the garage door may provide a bigger pop when people drive by your home, the front entry of the house can elicit an ooh or ahh of its own. A craftsman home may call for a wood-toned door with three or six panes of glass at the top. Modern front doors might be solid, painted brightly with interesting hardware. Some more traditional homes might even have side or door lights on either side of the front door with a transom to boot. As you might imagine, steel doors are are built with strength in mind and the ability to be painted any color you wish. There are several styles to choose from when it comes to steel doors, including paneling designs or decorative glass. Steel doors are also low maintenance, can last a lifetime, and have a 103% return on investment in the Pacific Northwest according to the Remodeling 2016 Cost vs. Value Report (www.costvsvalue.com). Combined with a steel door jamb, these doors rarely sag and are fire-resistant. However, steels doors can be dented, paint can be chipped, and any scratches may allow rust to appear. And, while steel doors may cost less than some fiberglass doors, steel doors just don’t have the flexibility of fiberglass. 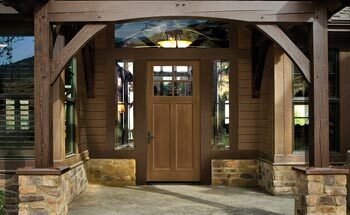 Fiberglass doors bring an unmatched flexibility to the front door competition. Like steel, high-definition panel profiles, a wide variety of glass designs, and low-maintenance care are staples for fiberglass doors. These doors can be painted or stained and have a texture similar to natural wood if desired. Fiberglass also ads an added layer of insulation that surpasses that of steel or wood and won’t rust or rot, either. The return on investment is higher than steel as well. This versatility comes at a price, though, and can cost much more than steel. Cheaper fiberglass can crack and require more maintenance over time. No matter which direction you go, Performance Building Products has the brands, styles, and installation expertise to give you the door that brings the nods of approval from your guests. Contact Performance Building Products today for a free quote today.